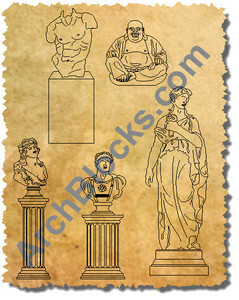 This is a beautiful assortment of CAD statues in elevation view drawn in AutoCAD .DWG format. They can be used in exterior or interior CAD design projects. This CAD blocks library includes CAD statues, CAD drawings of busts, outdoor landscape CAD lawn ornaments. Save Time! Download CAD Statues NOW! ArchBlocks.com products have a 100% staisfaction guarantee!